John and Jackie King – Wimbledon – Cat Eccles. Thank you very much for sorting out the poor cat and his very bad matts. You were so patient with him and, although he was very angry, he clearly wasn’t stressed by the experience. Even as you packed up, he was lying relaxed and playing with the toy mouse you gave him. His new lion cut has left him so comfortable in himself that my husband remarked that he appears to have a new lease of life. I will certainly recommend you and if we can’t cope with Eccles fur when it regrows, I will be straight back to you. If you have found yourself on this page, are a cat guardian who is looking for a Wimbledon cat groomer then you have definitely come to the correct place. 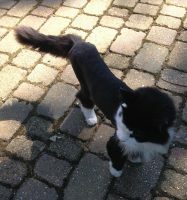 Why does our Wimbledon cat groomer stand out? Jackie and Eccles were happy with their Wimbledon cat groomer and you and your cat will be too!